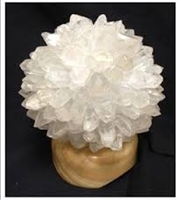 Selenite is an ancient stone, believed to have been given its name from the Greeks Goddess, Selene, for its "Moon-like Glow". Selenite is extremely useful for spinal alignment, any trauma to the bones-particularly the back, helpful in relieving aches and pains associated with arthritis or injury. 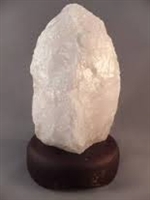 Reiki Masters are in favor of this crystal for its Distance Healing capabilities and in the Sending & Receiving of Energy. 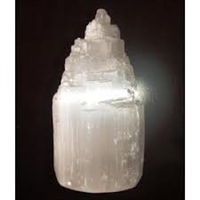 In addition, Selenite is believed to be useful for fertility. 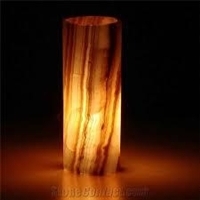 An illuminated Selenite Cathedral Lamp is truly a sight to see! 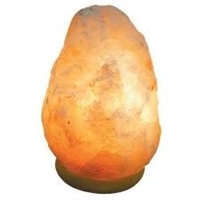 Pink Himalayan Salt Sphere Lamp on wooden base. Approx. 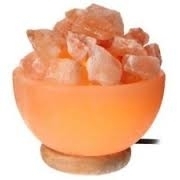 7"H x 6"
Pink Himalayan Salt Crystal Bowl with loose salt crystal pieces to fill bowl. 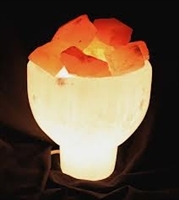 White Selenite Bowl with Orange Selenite Pieces to fill center of bowl. 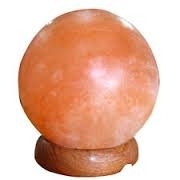 *Note: Gemstones have natural variations in coloring & markings no two are alike, with that, lamp purchased and received may differ slightly in coloring & marking. Differences include; color, soft yellow-gold-soft orange with markings/swirls of cream-soft beige-soft brown. If you are purchasing multipes, and would like two with similar markings, remark your request in the comments sections at checkout.